"Pirate" redirects here. For more uses, see Pirate (disambiguation). 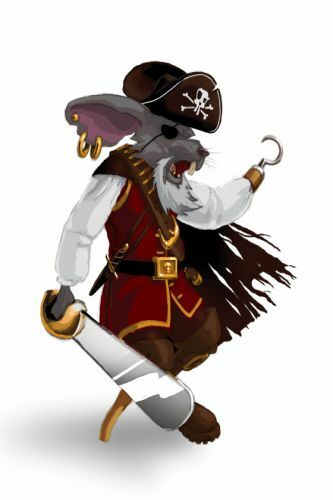 The Pirate Mouse is a breed of mouse found in the Harbour and aboard the S.S. Huntington IV locations. It is known to drop Satchel of Gold (250 gold) in the Harbour. Some say this commander of a mouse comes from a long line of pirates while others simply think his attire is the result of certain insanity. No matter the case, this mouse is known for its ability to steal cheese from even the most able of traps. As with any respectable pirate, there is sure to be gold in the pockets of this mouse. The Pirate Mouse has no specific preference for any kind of cheese. Hydro traps are very effective against the Pirate Mouse. Physical and Tactical traps are of normal effectiveness. The Pirate Mouse drops the Pirate Egg during the annual Spring Egg Hunt. 8 June 2010: The Pirate Mouse was removed from the Town of Gnawnia and Training Grounds as part of the release of MouseHunt 3.0. 14 April 2010: The Pirate Mouse Pirate began dropping a bonus Pirate Egg as loot as part of the Spring Egg Hunt 2011 event. 19 September 2013: As part of the Gnawnia mice population shift, the Pirate Mouse was removed from the Meadow. 17 October 2018: The Pirate Mouse changed mouse groups from Aquatic Order to Dock Dwellers. This page was last edited on 2 January 2019, at 13:35.